In a medium saucepan, combine the black rice and water and bring to a boil. Cover and simmer over low heat until the water has been absorbed and the rice is almost tender, about 40 minutes. Add the coconut milk and simmer, stirring occasionally, until the rice is tender and pudding-like, about 12 minutes. Stir in the sugar and vanilla and let cool to room temperature. In a medium saucepan, combine the jasmine rice and water and bring to a boil. Cover and simmer over low heat until the water is absorbed and the rice is tender, about 25 minutes. Add 1 cup of the coconut milk and the sugar and simmer, stirring occasionally, until the rice is thickened, about 1 hour. Stir in the diced pineapple, nutmeg and the remaining 1/4 cup of coconut milk and let the jasmine rice pudding cool to room temperature. 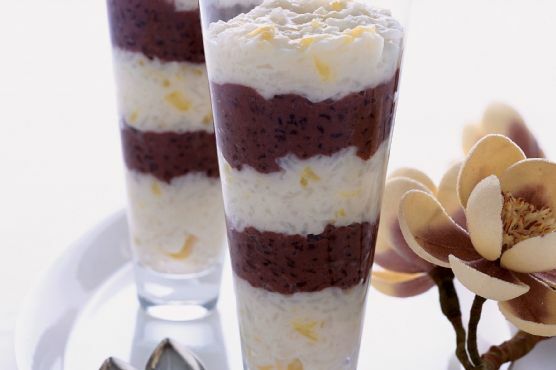 Layer the puddings in 4 glasses, alternating 3 layers of jasmine rice with 2 layers of black rice. Rice Pudding on the menu? Try pairing with Cream Sherry, Port, and Moscato d'Asti. A common wine pairing rule is to make sure your wine is sweeter than your food. Delicate desserts go well with Moscato d'Asti, nutty desserts with cream sherry, and caramel or chocolate desserts pair well with port.